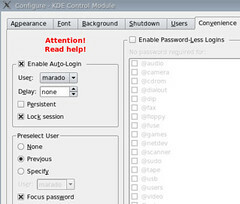 Here's a really usefull tip, thanks to Bram: if you have a Linux machine where you're the only one supposed to log on in there, and if you use kdm, you might want to speed-up your user experience by setting KDM's auto login on. If you do that, after your X starts, you'll automaticly log in into your session. I didn't use that because it would be a high security risk (anyone would enter with my user on my computer), so I was glad to know about the option you can see in the screenshot: I don't know since when that option is there, but it is awsome, since you log in but the screensaver is automaticly fired up, so I still have to insert my password. The only difference is that I don't have to insert the password and then wait some more: when you do it you'll be already in your logged session. Am I getting too old? Microsoft Zune: even non-techies kill the killer!